Highlighting fourteen stories from the Old and New Testaments, including the first Easter and the first Christmas, this sensitively presented story Bible offers a first look at the wonders of God's word for very young children. Carefully written text and heartwarming illustrations gently instill a basic understanding of God's love and amazing Bible stories for little ones to treasure throughout their lives. It is sure to be an instant family favourite. 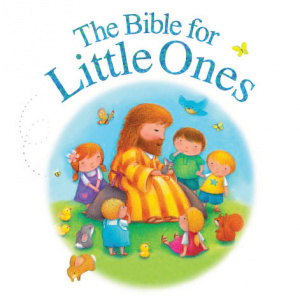 The Bible for Little Ones by Juliet David was published by Lion Hudson in March 2012 and is our 2918th best seller. The ISBN for The Bible for Little Ones is 9781859859230. The softly coloured illustrations and the very simple text make this book an excellent introduction to stories that a young child will grow to know in more detail as they get older. Books for young children abound with all these stories told in a multiple of ways, but there is plenty here for a little one, and the adult can always answer any questions that may be asked. Got a question? No problem! Just click here to ask us about The Bible for Little Ones.